Recently, I did some school visits in the small town of Cole Camp, Missouri. Two teens, Laura and Sarah, had prepared some great questions. Some I have never been asked and was delighted to hear! Q. Do you write more than one book at a time? A. I often do, but I am usually in different stages. I might be editing one book, writing a second, promoting a third, and brainstorming a fourth. Q. Have you ever written a story, then trashed it but kept the same characters? A. This happened once with an adult book I wrote. The editor didn't like the plot, but said I could keep the characters. And I had to write it in just nine weeks. I did it, but it was extremely difficult. Q. Can you successfully start out as a writer financially or would you have to get another regular job? A. That's a great question! It's the rare writer who makes a living with their very first book, so you will probably have to have a regular job and write on the side for a while. One great thing is that there are jobs for writers with many companies. That's what I used to do. It taught me that I didn't need to feel creative to write. If I had told my boss that I would not write the brochure or the newsletter until I felt the muse was speaking to me, I would have been fired. Q. Have you written any other genres besides mystery/thriller? Have you considered writing them? A. My first three books, which never got published, were a drama, a family drama, and an historical novel about orphan trains. After I started getting published, I I wrote a book that would probably be classified as woman's fiction, a children's chapter book, and a book about Huntington's Disease - none of those got picked up. I could see myself writing some post apocalyptic, which is basically a thriller in another form. I like mysteries and thrillers - I like learning about forensic evidence, creating twists, and the drama of the built-in high stakes. Q. After you finish writing a book, do you miss it/the writing process? A. I always think I am going to be so glad when I finish a book and that I will have a bunch of free time and do all these fun things - but I often feel weird and at loose ends. Q. Do you have to live in a specific place [to be a writer]? A. No! You can live anyplace. Pretty much everything is worked out by phone, mail and email. Q. When you write, have you ever thought of multiple scenarios that could happen? How do you pick which one? A. Yes, I often think of multiple events that could happen. I might combine them, or see if I can have them happen sequentially. We want our characters to have a lot of problems and strife in their life. If I can only choose one, I choose the one that will make the character feel the most emotion. Q. Who is your fav author? A. I have been reading too long to have one favorite author. I do really like Susan Beth Pfeffer's Life as We Knew It. Q. 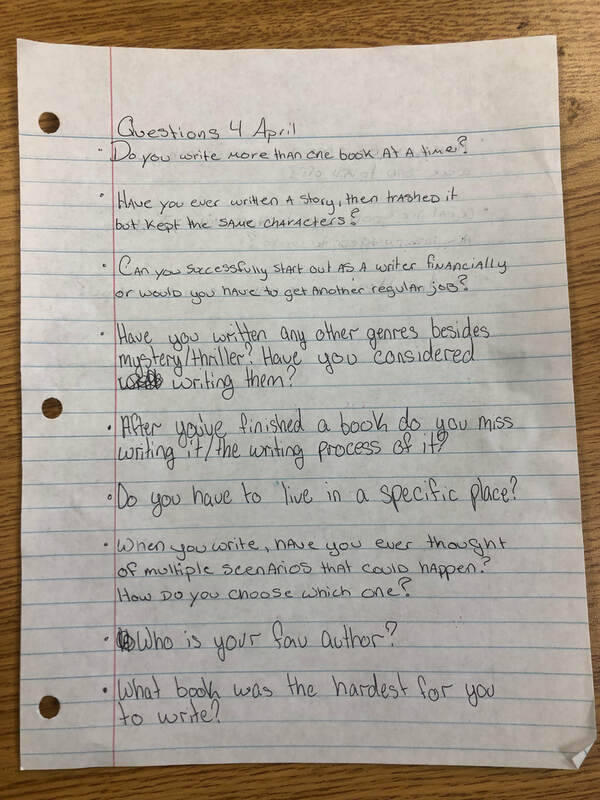 What book was the hardest for you to write? A. Count All Her Bones was really tough, because I broke my hand when I still had about 10,000 words to write. I had to do them all by voice dictation. If you have ever talked to your phone, you'll know voice dictation is only about 90 percent accurate. That's a lot of things to fix when you can only use one hand. Q. Have you ever had a character you were sad to kill off? A. I'm usually okay with killing characters. Years ago I wrote a book called Learning to Fly and there was a minor character named Brad who was a single dad to a nine-year-old girl. Brad died in the story. I found myself very concerned about his daughter. Who would she live with? I felt terrible. I had to remind myself that she was fictional. Q. What are good ways to start writing if you are discouraged to write? A. Set small goals, like writing for ten minutes or writing 100 words. Tell yourself you are just practicing writing. Tell yourself it's okay to write crap. You can always edit crap, you can't edit nothing. When you first start out, you probably won't write that well. The only way you learn how to do something really well is to do it badly at first. Q. 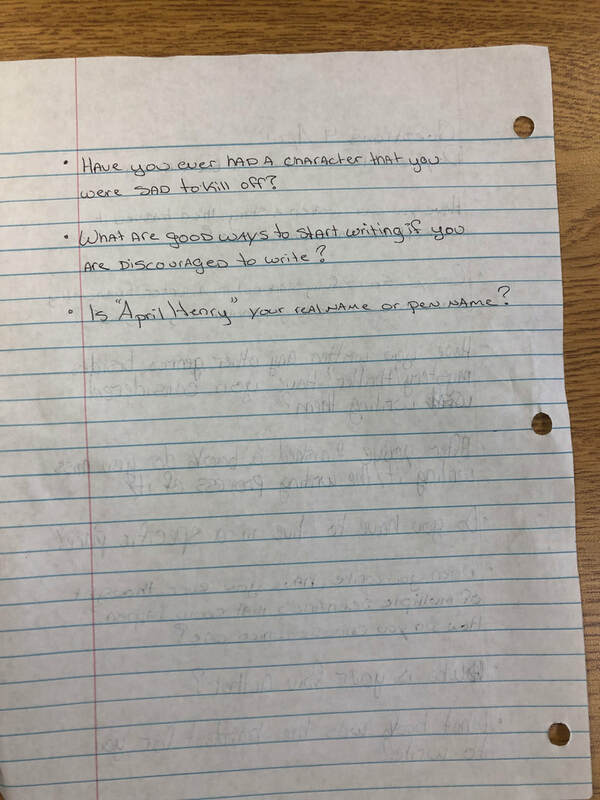 Is April Henry a pen name or your real name? A. Real. You want to make everyone you went to high school with jealous.